Notes: Excludes census data for one or more incompletely enumerated Indian reserves or Indian settlements. Low-income measure, after tax (LIM-AT) – The Low-income measure, after tax, refers to a fixed percentage (50%) of median adjusted after-tax income of private households. The household after-tax income is adjusted by an equivalence scale to take economies of scale into account. This adjustment for different household sizes reflects the fact that a household’s needs increase, but at a decreasing rate, as the number of members increases. Using data from the 2016 Census of Population, the line applicable to a household is defined as half the Canadian median of the adjusted household after-tax income, multiplied by the square root of household size. The median is determined based on all persons in private households where low-income concepts are applicable. Thresholds for specific household sizes are presented in Table 4.2 Low-income measures thresholds (LIM-AT and LIM-BT) for private households of Canada, 2015, Dictionary, Census of Population, 2016. When the unadjusted after-tax income of household pertaining to a person falls below the threshold applicable to the person based on household size, the person is considered to be in low income according to LIM-AT. Since the LIM-AT threshold and household income are unique within each household, low-income status based on LIM-AT can also be reported for households. Users should be aware that the estimates associated with this variable are more affected than most by the incomplete enumeration of certain Indian reserves and Indian settlements in the Census of Population. For more information on Aboriginal variables, including information on their classifications, the questions from which they are derived, data quality and their comparability with other sources of data, please refer to the Aboriginal Peoples Reference Guide, Census of Population, 2016 and the Aboriginal Peoples Technical Report, Census of Population, 2016. Aboriginal identity’ includes persons who are First Nations (North American Indian), Métis or Inuk (Inuit) and/or those who are Registered or Treaty Indians (that is, registered under the Indian Act of Canada) and/or those who have membership in a First Nation or Indian band. Aboriginal peoples of Canada are defined in the Constitution Act, 1982, section 35 (2) as including the Indian, Inuit and Métis peoples of Canada. Multiple Aboriginal responses’ includes persons who are any two or all three of the following: First Nations (North American Indian), Métis or Inuk (Inuit). http://www12.statcan.gc.ca/census-recensement/2016/dp-pd/dt-td/Rp-eng.cfm?TABID=2&LANG=E&A=R&APATH=3&DETAIL=0&DIM=0&FL=A&FREE=0&GC=01&GL=-1&GID=1341679&GK=1&GRP=1&O=D&PID=111095&PRID=10&PTYPE=109445&S=0&SHOWALL=0&SUB=0&Temporal=2017&THEME=122&VID=0&VNAMEE=&VNAMEF=&D1=0&D2=0&D3=1&D4=0&D5=0&D6=0 -accessed October 21, 2017. 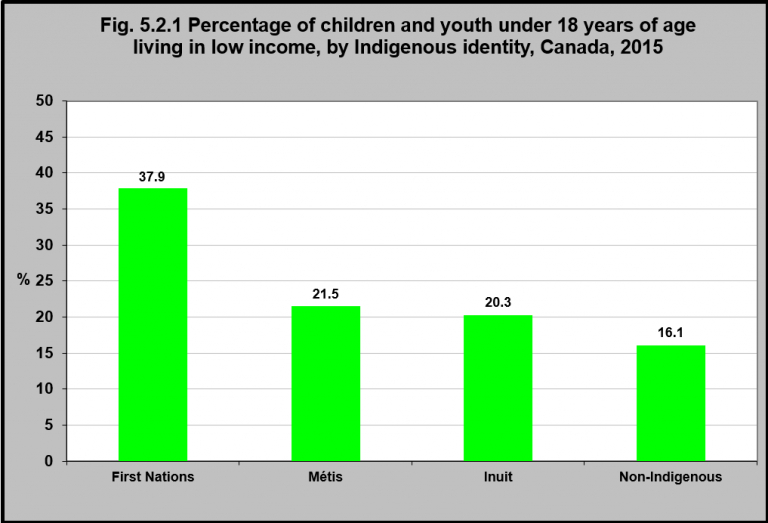 In 2015, 37.9% of First Nations children and youth under 18 lived in low income. That was the case for 21.5% of Métis children and youth, 20.3% of Inuk (Inuit) children and youth, and 16.1% of non-Indigenous children and youth.